A Kentucky woman was faced with the realization that her husband was not going to be here to experience the birth of their first child after he was deployed. Even though Cpl. Andrew Powell, a U.S. Marine, wasn’t able to make it home Wednesday for the big day, he was still able to talk his wife through her labor, thanks to modern technology. 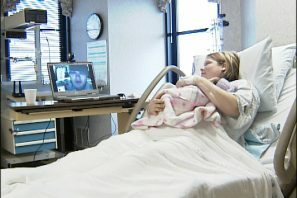 Ephraim McDowell Regional Medical Center provided the expectant mom with a web cam, a laptop, and an Internet connection. This allowed Andrew to be there on the monitor the whole time, on the monitor, to talk her through her first delivery. “I’m just so happy.. I didn’t think it would really happen,” Kristin Powell said after about seven hours of labor. “I can’t find the words to describe it,” Andrew Powell said. A few months ago Kristin had asked the hospital if they could provide the webcam service. Hospital officials had rarely heard of broadcasting a birth online, and didn’t know much about it. But after a little research, they made it happen. Bailey Mae Powell was born 7.5 ounces, and practically right before her father’s eyes. I guess it just goes to show that you never know until you ask. I bet that you will hear more of this happening now that it was such a success!